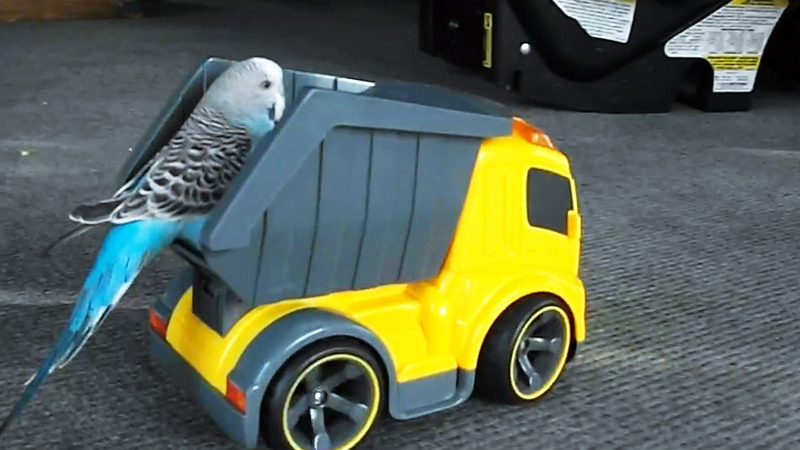 Parakeet loves to ride in RC dump truck, on The Feed! Some of the latest and greatest viral videos include a budgie in a radio-controlled dump truck and a deaf man with magically limber fingers. First up, Frank the budgie -- or budgerigar, or parakeet, or bird, or whatever you wanna call it -- does not take full advantage of his ability to fly. Instead, he prefers to be carted around in the back of a radio-controlled dump truck as evidenced in this video from Gordon Miller. Andrey Dragunov is deaf, but that doesn't stop him from turning any date into dinner and a show. As this video from Irina Tazhigulova shows, his magically limber fingers create optical illusions that would make Marcel Marceau scratch his head.